The Johnston Elementary School Chorus was a part of last year’s Johnston Peach Blossom Festival. 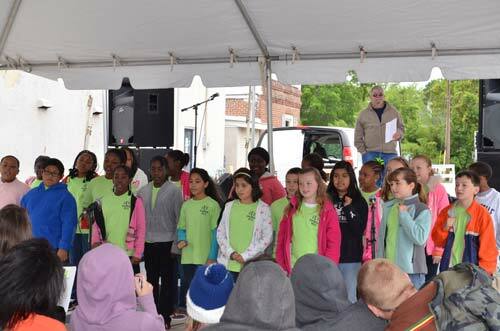 The Johnston, S.C., Peach Blossom Festival wants you! Entertainment has been a big part of the 31 years of the Festival, and now is your chance to be a part of the historic Festival. The Festival wants to feature talented people, local and not-so local, as part of the day-long entertainment in the 31st annual event, held in downtown Johnston on May 3. Entertainers who think they have what it takes to be a part of this year’s Festival should contact Tonya King, (803) 275-3132, 906 Hillcrest Dr., Johnston, SC 29832, king3774@bellsouth.net. The Festival is now taking applications for individuals, organizations and businesses interested in being a part of the Festival’s parade. New this year: A $50 prize will be awarded to the best homemade float! In addition to the areas listed above, the Festival also has a Friday, May 2, street dance in downtown Johnston, designed especially for families. For more information on the Festival, please contact Debra Aston, (803) 275-2345.